I was driving home from the gym yesterday and found myself musing back on a frustration that happened years ago. A former student who had served as my teaching assistant for one of my classes at MICA called me up after their graduation and asked me if we could get together for lunch. They needed professional advice. The student had been a real favorite of mine and had been a great aid with teaching one of my classes. We met in a deli near my school and the former student picked my brain about how they could further their career as a painter, work with galleries, gain collectors, and land a college teaching job. In a situation like that I feel honored to be seen as someone who knows about such things, and I try to be as helpful as possible. Happily the student has gone on to some success with exhibiting their work and has a good job teaching art at a university. 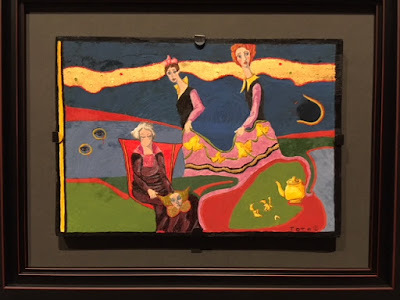 But after our meeting I felt a little uncomfortable and realized that for the two hours we had spent together, the former student hadn't once asked me anything about myself or my painting, or even thanked me for my time except in a perfunctory way. I walked away from the encounter wondering if I had ever been that self absorbed when I was an art student. Looking back at how I'd interacted with a lot of my professors, including the ones I really liked, I reluctantly concluded that sometimes the answer had to be yes. 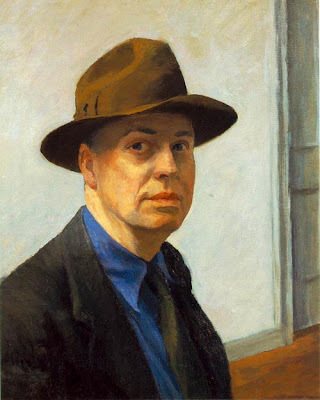 The art historian Gail Levin wrote a big biography of Edward Hopper that drew extensively from Hopper's spouse Jo's diary. According to Jo, her husband was often cruel to her and they frequently had stormy battles. One of these altercations ended according to Jo with her grabbing Edward's wrist and biting him so hard that she exposed the bone. Edward isn't here to defend himself against this charge, but from other accounts I've heard from people who had direct dealings with Hopper I've been told he was often remote or even rude. So the question remains, what to make of Hopper? One of the things that drives me a little batty are all the writings about Hopper that dwell on feelings of loneliness and isolation one can find in his paintings. Well there is some of that, but often I wonder if the writer isn't just projecting some of their own emotional baggage onto Hopper's art. I can't think of an artist who, through his work, better celebrated the brilliance and drama of pure sunlight than Edward Hopper. At this he was amazing. Especially when you see his work in person and can go right up to the canvas' surface you sense how colorful and rich his paintings are. Sometimes in the little corners of his paintings the layering of unexpected but perfectly chosen hues just takes your breath away. So many of his paintings are light years away from the listless and alien adjectives that have been placed on them by later commentators. I never met Hopper in person. If even half the stories about his troublesome behavior are true, I glad I'm didn't. Instead I know him thought his art. 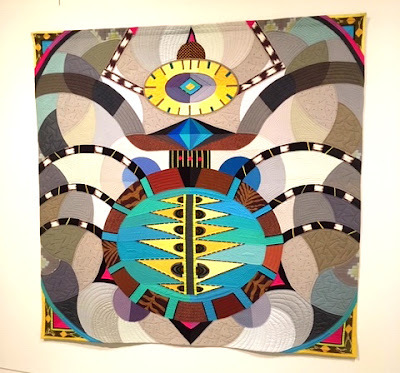 His work is an affirmation of the warmth and richness that being alive on the earth can offer us. There is a palpable delight in color and light and shadow. If that is experienced by one of his figures who is lost in a private reverie or enjoying a quiet moment of solitude, so much the better. To me the world is a richer place because of the work Edward Hopper left behind. His paintings are tools that show us how to see and feel more deeply. This is an extremely generous thing he gives us. To do it he had to devote himself to the often trying, difficult work of making extraordinary paintings (trust me, this ain't work for the faint of heart). On that same drive home when I was stewing about my disappointment with that former student, I also noticed a stand of trees I'd passed many times before. I'd never really looked them. Perhaps the light was just right this time but they leaped out at me as having the most amazing color and pattern. And suddenly my irritability was swept away and I felt fortunate to live in a world that has such a garden of verdant delights. And I also felt gratitude for all the painters who'd done great landscape paintings that have helped me learn how to see the beauty and the meaning that is out there in the natural world. As I looked for an image of just such a painting to illustrate this blog post, I stumbled across the moonlitEaton painting above. He's a guy I know almost nothing about other than that George Inness (another of my heroes) and he at one time both had studios in the same building in New York City. Inness once bought one of his paintings. As a kid growing up in the woods of upstate New York one of my all time favorite things was how the forest looked on nights with a full moon. It delighted me, but those sorts of things tend to stay locked away as a private reverie. 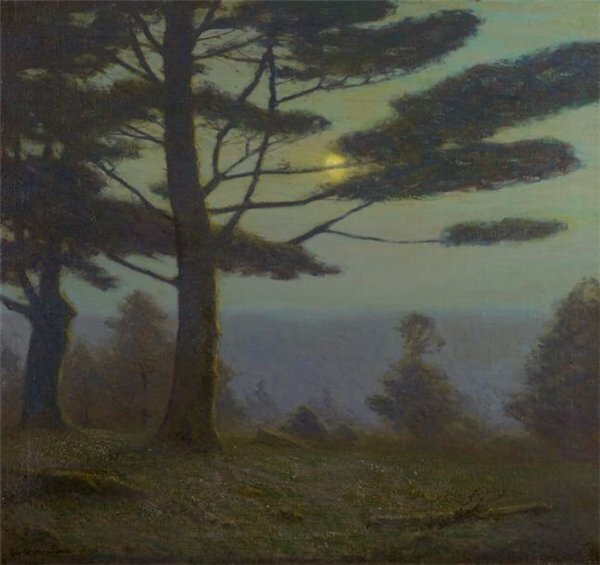 Then you stumble into a painting like this by Eaton and you know there's someone else who was standing with you in those woods, drinking in the magic of the moonlight filtering through those pine branches. P.S. I suppose this is a terrible point to toot my own horn, casting a spotlight as it will on my own self absorption, but the Maryland Institute College of Art's new Sept./Oct. newsletter, Juxtapositions, is just out. 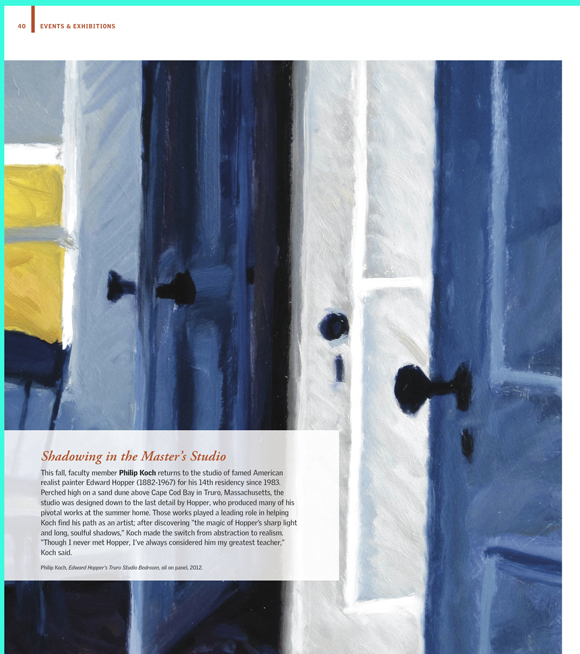 It has a full page feature on my 14 residencies over the years in Hopper's old studio on Cape Cod. How timely that you have written this post about this particular struggle as an artist. From my own personal experience this has been a real tight wire act that I am sorry to say has often resulted in not being very productive. I have learned that in order to create one has to jealously guard their time and opportunities to paint. I suppose that may seem selfish to some but otherwise how will the work get done? 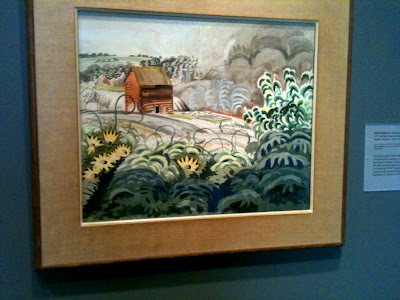 Hopper wouldn't have created what he did without his dedication and that does require choosing how to spend one's time. I do so relate to your experience of seeing the landscape for the first time in a certain light especially while driving as I do that a lot. If only I had the luxury of time to paint even a tenth of what inspires me. We just have to keep on working regardless of others ideas of how we should be. hello philip. i must say i enjoy your website. you provide all of us who read you words with a hugh amount of information.i find your stories really meaningful and thoughtful. thank you for your generosity with your time and insights. I've been reading your blog for a while. I just had to comment on this post. I find many successful artists appear to be self-absorbed (although not all are necessarily difficult people). It seems like a certain amount of self-absorption is required to make a living in a game like painting. However, I've also noticed that people in the psychology field are even more self-absorbed. I've yet to figure that one out! Thanks so much for your comments. Yes, artists must guard their time and energy- nobody else will do it for us. And it takes time, sometimes very much time, to get a painting just right. Maybe the problem with excessive self absorption is that it can close too many doors. I think of all the times when to my surprise some of the most unlikely of people have showed me something new that turned out to be of real value. Too much focus on oneself can end up impoverishing oneself. Just like in painting, living life successfully depends on struggling for a precarious balance. On our good days, and there can be a lot of them, we can manage it. Thanks for your kind words. Much appreciated at this end!